Most of the fears and questions surrounding radiation have been answered very well over the years and all studies point to the need to have a reasonable threshold for radiation below which we don’t have to worry about health effects. And we don’t have to spend billions protecting against a phantom menace. A better question might be – How much do we consider the value of a human life to be? Dr. James Conca is the Senior Scientist at UFA Ventures, Inc. in the Tri-Cities, Washington, an Affiliate Scientist at Los Alamos National Laboratory. Dr. Conca is an expert on energy, nuclear and dirty bombs, a planetary geologist, and a professional speaker. He is also an ANS member and part of the ANS Social Media Team. Follow him on Twitter @jimconca and see his book at Amazon.com. The NRC staff learned shortly after TMI that if they approve anything they are vilified in the media and berated on Capital Hill. If they approve nothing and regulate to ridiculously low limits the pay is the same and life is good. Senator Domenici demonstrated many years ago that the only way to change this mindset is to introduce an authorization bill that cuts the NRC budget by 30% or more. If we don’t have a plan to make that happen, then we don’t have a plan. Thanks for finally talking about > Radiation and the Value of a Human Life | ANS Nuclear Cafe < Liked it! Health effects from chemical or radiation insults are negligible at low enough doses where the body’s defenses can easily deal with them, then become proportional to the dose as the body’s defenses become saturated. A smoother way to picture this than that frequently presented, including by Dr. Conca, would be a function which is quadratic starting at the origin, then gradually becomes linear at higher values of the dose. Mathematically this is the upward facing segment of a hyperbola that intersects the origin. Mortality/1000-person-a arising from malignant neoplasms at Hiroshima and Nagasaki is presented 1950-1974 . Except at zero exposure, Hiroshima Data is different from Nagasaki data, even at extreme of error bars, which generally do not overlap. In the instance of breast cancer, time delay is greater than 10 a . Low Dose analysis requires curve fitting: “Disagreement about the somatic risks from low doses of ionizing radiation stem from two difficulties fundamental to the logic of inference from observational data. First, precise direct estimation of small risks requires impractably large samples. Second, precise estimates of low-dose risks based on high-dose data, for which the sample size requirements are more easily satisfied, must depend heavily on assumptions about the shape of the dose-response curve, even when only a few of the parameters of the theoretical form of the curve are unknown.” There is also the issue that cancer mortality is constantly dropping, with leukemia mortality being half what it was in 1945. Paraphrased: 1.0 Sv mammograms (normal mammogram does is ~0.004 Sv) would have to be given to more than 10,000 women, all the same age, to have a statistically significant test of LNT, and the result would only be available after 2035, 15 years before CO2 doubles. Using Hiroshima data, each Sv dose increases annual cancer death rate by ~1/2. ICRP Publication 103, 2007, LNT whole risk coefficient is 0.057/Sv-life . Result: Curve fit to Hiroshima bomb data, 0 to 2.8 Sv, supports LNT. At 350 rads, Hiroshima mortality drops to ~3.5/1000-a, then rises to 5/1000-a at 550 rad. Hiroshima bomb had neutrons which are difficult to convert to Sv. Hiroshima annual cancer mortality at 1.0 Sv is 0.0029/a, 1.45 times zero radiation exposure rate. = 0.0018/a + 0.00006/Sv^2-a * Sv^2 = annual risk per person. Using Nagasaki data, each Sv dose increases annual cancer death rate by ~3%. Nagasaki annual cancer mortality at 1.0 Sv is 0.00186/a, 1.03 times zero radiation exposure rate. At 1 Sv, Hiroshima elevated mortality rate is more than 10 times Nagasaki rate. Similar Hiroshima versus Nagasaki mortality results is obtained from 1980-CONAES , which is a good starting point for any energy research. Alvin M. Weinberg, “The Future of Nuclear Energy,” I:Physics Today, Volume 34, Number 3, p48, doai: 10.1063/1.2914469, http://ds.doi.org/10.1063/1.2914469, (1980). 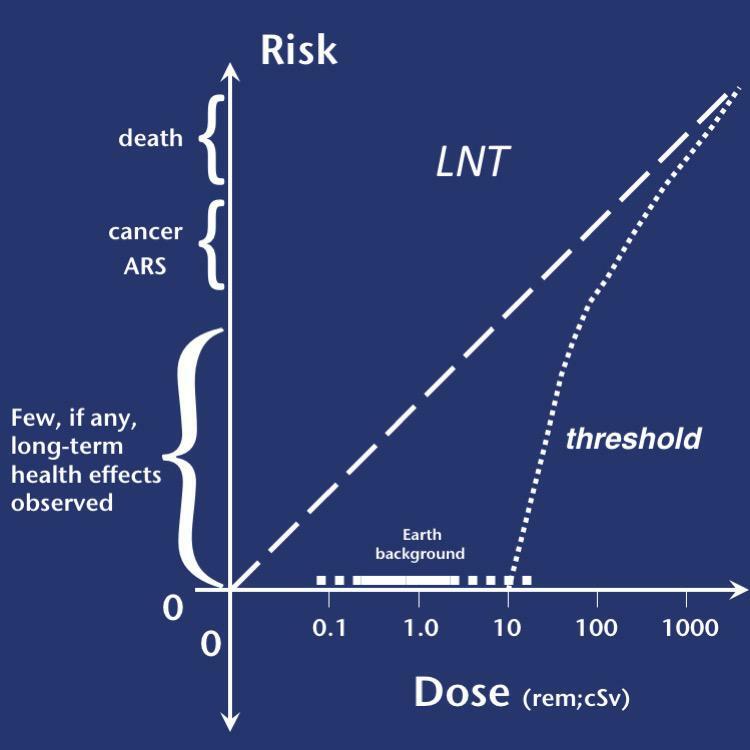 Charles E. Land, Health statistician, Environmental Epidemiology Branch of the National Cancer Institute, Bethsda, Maryland, 20205, “Estimating Cancer Risks from Low Doses of Ionizing Radiation,” I: Science, B: 209, pp. 1197 – 1199, (September 9, 1980). Radiation Protection Recommendations, I:ICRP Publication 103, Nominal risk coefficients, 10^-2/Sv for stochastic effects after low-dose exposure, Annex A, (2007). Harvey Brooks and Edward L. Ginzton, co-Chairman, “Energy in Transition , 1985-2010: Final Report of the Committee on Nuclear and Alternative Energy Systems, Committee on Nuclear and Alternative Energy Systems, National Research Council, ISBN: 0-309-66780-1, http://www.nap.edu/catalog/11771.html, (1980). As a nuclear engineer for 40+ years, I dealt with this issue continuously while designing shielding and radiation protection systems. It seems to me that the HPS needs to have a hearing with the ICRP and or the NCRP to present this case and see if we can get the rules and guidelines changed. Merely putting this argument in front of like-minded folks will not accomplish changing the rules. I do believe that Dr. Conca has done a masterful job of presenting a rational argument. Thank you Dr. Conca. Nice to chat with you at the ANS Philadelphia meeting in June. I wanted to pass on a thought on a potential interim initiative for a change in NRC regulations. I think ALARA was an arbitrary way of encouraging low doses, and could be changed, even without adopting new science. A rulemaking proposal for a staged licensee and NRC response could provide equivalent protection at much reduced cost, I think. The rule could be based on response to actual measured individual exposures, with graded licensee root cause investigations and NRC response. There is now a de minimus level ( 2 mrem) under ALARA. If licensees were required to track individual occupational exposure trends above 50 mrem or so, initiate a root cause investigation at 100 mrem (the current NRC adequate protection limit for the general public), and NRC investigate at 1 rem, this would provide adequate margin below the occupational exposure limits. I am not sure collective dose targets are meaningful at low levels. I am a health physicist and I couldn’t agree with you more on the ridiculousness of the LNT model. In fact, I can’t think of any health physicist I know that would disagree with you. It is interesting the dollar figures you stated for other things in your article. Well done! 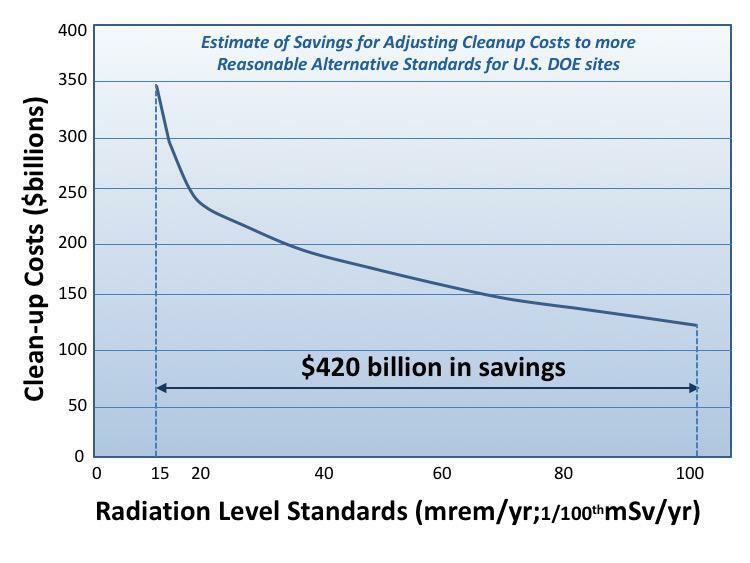 Hopefully, shining a big, bright light on this issue, as was done at the HPS Annual Meeting (which I attended), will effect some change in this policy of over-conservatism with radiation dose.